Following on from my earlier post this week on student loan debt from a UK parent’s perspective, I have another post about student loan debt today – this time for my US readers. It’s been written by Andrew who blogs over at Scholarship Fly. It’s Andrew’s mission to spread the word about scholarships to help students avoid student loan debt. This day and age, college is established as a place and time to meet new people and try new things. More than one college graduate would not hesitate to say that college was the best time of their lives. Despite having such a reputation for fun experiences, there is another developing stigma to consider: student loan debt. From a 2014 study, roughly 70% of college students take out student loans. There is a total of $1.3 trillion in outstanding student loan debt, and the average student loan debt per borrower is around $30,000. The default and delinquency rate is roughly 25%. Given just a few pieces of information, it is easy to see that student loan debt is an issue, and this is by no means a unique issue. Student loans have become a necessity for anyone planning to attend college in light of the rising cost of tuition and demand for higher education. The effects of student loans are felt in the up-and-coming generation of workers; for instance, important financial objectives such as starting a retirement fund and owning a home are neglected and put off. Luckily, there are solutions to this mounting problem. Below are a few pieces of advice that can help a debtor alleviate their concerns and obligations with student loan debt. There is such thing as “free money” for college. There are numerous organizations and foundations across the globe that offer free financial aid, or scholarships, to students. They are awarded for a wide range of criteria such as merit, heritage, major, hair color, or even being left-handed. Scholarships are a great place to start when looking for ways to finance college since there are thousands of opportunities found online on scholarship search engines. Applications are free of charge, so there is not much of an excuse for ignoring these opportunities. There are several secrets to securing a piece of this “free money.” Starting early and looking often is the best way to apply for volume. Researching the eligibility requirements is essential to improve chances of success. Finding a niche scholarship (like a left-handed scholarship) is a good way to lower the competition field. Looking for scholarships is a labor intensive task, but it can save much more trouble than it causes. These financial aid opportunities are important because their benefits are numerous. They do not require repayment, and they do not accrue interest each month. On top of this, they are almost as readily available as federal student loans. Scholarships are easily the best alternatives to taking on student loan debt. Similar to scholarships, there are different types of grants available to college students as an alternative to student loans. These grants do not require repayment, and they are usually provided by universities and the Federal government. There are a few potential federal grants available to students after filling out the FAFSA. The most common is the Pell Grant which is awarded to undergraduate students who qualify under the FAFSA. Another grant, the Federal Supplemental Educational Opportunity Grant (FSEOG), is awarded to undergraduates who are designated with a greater need for financial aid. In addition to federal grants, many colleges and universities award their own grants as financial aid to their students. These grants are normally given out based on merit; for instance, these grants often serve as an incentive for smart students to choose one school over another. Just like scholarships, grants are known as “free money,” so it is no secret how valuable these can be. 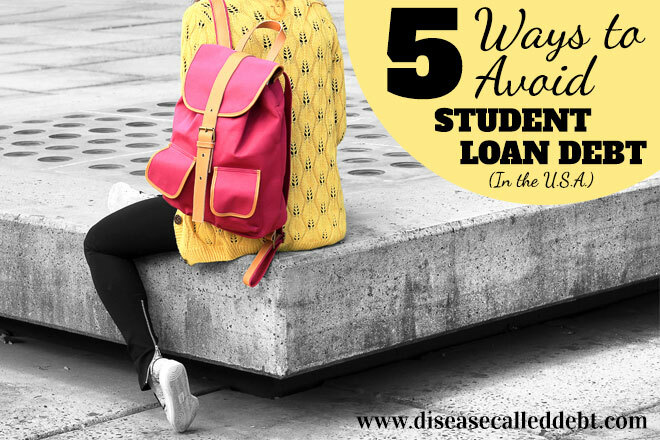 While these opportunities seem to be less diverse and numerous, they are still a viable alternative to signing up for a student loan. If you have multiple student loans with high interest rates, then you may want to consider refinancing your student loans. Many college students need to take out more than one loan over four years. Multiple loans with multiple interest rates can become a disorganized mess with mounting monthly payments. Refinancing can save thousands of dollars on student loans over the course of a loan repayment term. This is how it works. A private company buys out a borrower’s loans and consolidates them into one loan with one interest rate. While this does not lower the principal loan amount, it cuts away potential interest payments on student loans in the future. Overall, student loan refinancing is an option that is mounting in popularity. While it is not quite as enticing as “free money,” it is still a way to keep student loan debt from getting out of hand. While in school, there are two options for students in terms of paying interest: pay interest monthly or defer payments. To many college students, deferring interest payments is an overwhelmingly popular choice, but this often leads to more debt down the road. By deferring student loan payments, borrowers guarantee taking on considerably more debt over the life of their loan. Interest capitalizes on student loans. This means each monthly interest accrual is added to the original principal amount. This creates a snowball effect where each month brings a larger interest accrual. With all of this in mind, it is easy to see how starting interest payments early reduces overall student loan debt. To the broke college student, this may not be a viable option, but it is important to try and make these payments as early as possible. While a little different than paying interest during school, making larger monthly principal payments helps fight interest and capitalization as well. Paying more than the minimum monthly payment helps reduce the overall remaining principal balance, and less interest can build as a result of smaller principal balances each month. This accomplishes the same thing as paying interest during school since it reduces the amount spent on interest over the life of a loan. In the end, it reduces student loan debt by attacking interest which is established as one of the major culprits of debt. Ideally, the combination of making larger monthly payments and paying interest early on is the best way to cut away student loan debt since both of these habits help eliminate student loans faster than their projected repayment terms. Author bio: Andrew is a freelance writer and content manager who has taken an interest in personal finance. After graduating from college with plenty of student loan debt, he decided to start spreading advice on student loans and funding higher education. It is his goal to help create a trend towards greater financial literacy overall one article at a time. *Photos courtesy of Unsplash with text overlay added. I think working a little bit, even a few hours a week, while at school is a great way to avoid some of the costs associated with loans, as this can provide spending money or offset some costs that otherwise might need to be handled with loans. When it comes to loans like this, every bit that you can get rid of helps. I love these tips. I think these will help a lot of people. I wish I would have looked for more scholarships! I receive a good amount, but I didn’t actively seek anything else extra outside of what my university gave me. Me too, Michelle! I wish I had looked for a scholarship. 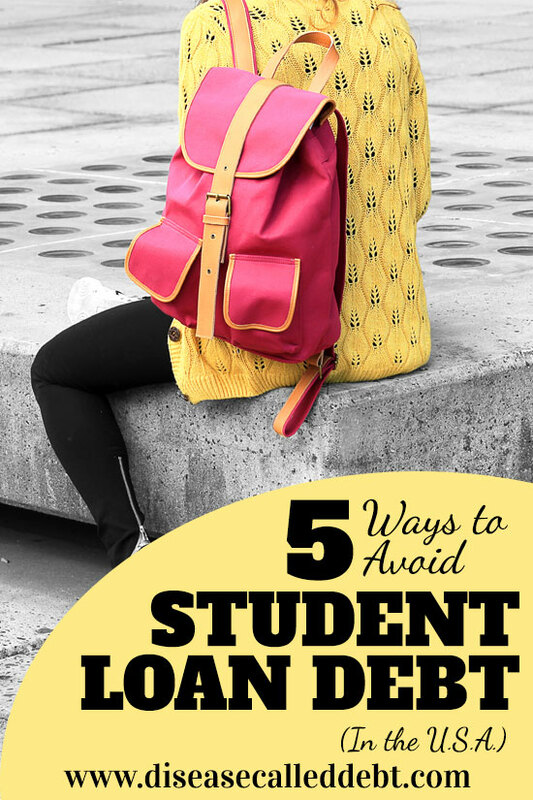 If I did, I didn’t have to pay for my student loan after college, and it would really great as I would focus on earning and saving money without minding paying my loan. Jamie recently posted…Should the Government Sponsor Olympic Athletes? Scholarships and grants can make a huge difference in the cost of education. I hope incoming college students are taking advantage of all the resources that are out there to avoid student loan debt. Michelle @ Lively Chicken recently posted…More Important than Money? Great article. I made payments during grad school (the second time) so that my loans weren’t higher than I borrowed when i graduated, and that helped so much in allowing me to pay them down quickly afterwards. And I wish I’d applied for scholarships during school as well as before school. So many students think once they are in school they don’t need to keep looking. I also like the advice of looking for smaller scholarships as well as the biggies because the competition is a lot less. I actually did get a full academic scholarship, much to my own amazement. I wasn’t in the top 10 of my class, but I had a decent GPA and a strong ACT score. It’s always worth trying. I would add that you can bootstrap your way through. If my kids want to attend college and don’t get scholarships, I’ll expect them to work summers to pay for the following school year. There’s no way I want them saddled with the debt that so many of us have around our necks! We went the scholarship and grant route… Served us well! These are great tips! I would also add one big tip: Choose your college wisely and know the total amount it will cost as compared to your expected starting salary. This strategy could eliminate the need for debt or at least minimize it!